Our mission is to help transform a community in rural Uganda… to give people in one of the most deprived regions in Africa the opportunity to escape from poverty. Kanungu in South-western Uganda where we work is one of the poorest parts of Uganda. Most families rely on subsistence farming for a living and people have little opportunity to gain an education and improve the lives of their families. Teach Uganda is a network of organisations who have worked with the local community over twenty years to understand the needs of the community and systematically provide the resources which are needed. We build and run great schools to give children the chance to create a future for themselves and their community. We provide a University to educate people to the next level and to train science teachers who are much needed locally. And we support enterprise projects to help build the local economy. It is great to visit Kanungu regularly because we can see clearly the difference this work is making to people there. With your continued help we look forward to seeing further improvements in future. Gill (a retired teacher) and Steve (with an IT background) are spending a month as volunteers in Kanungu. Read their fascinating blog here about Gill's first 'O' level literature class at the High School and Steve getting the IT working better. Perhaps most interesting is the insight their blog gives into the beauty, joys and frustrations of life in rural Uganda. Why do we work in rural Uganda? Of people are children under 16 years old. Of people are educated even to Primary level. Of people are educated to Secondary Level or beyond. Of working people’s main source of income is subsistence farming. Average number of people per household. Number of living siblings per household. Number of non-living siblings per household. Average no of children for each mother. 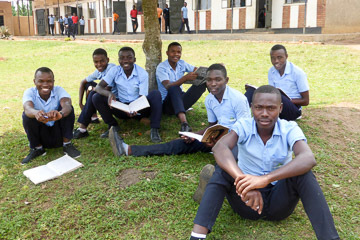 By creating an educational network from nursery schools to University, we give young people in the area the chance to gain a decent education, learn skills, build enterprises and, step by step, transform the community. Kanungu people are enthusiastic and hard working…they grab the opportunities that are available to them. Uganda has had a stable government for over 30 years, so we are creating long-term change, not crisis management. This involves more than just providing schools; we have to work on the infrastructure (water, electricity) and provide help to improve teaching methods. Here is an introduction to some of our projects. Click on the links below or the menu above for more information and the latest news from Kanungu. CHIFCOD, our partner in Kanungu, runs four primary schools. 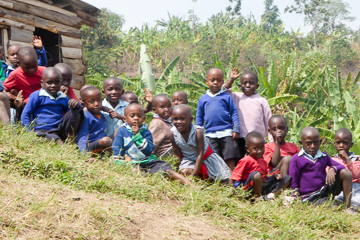 Two of them, Kirima Parents’ and Nyakabungo Parents’ are funded by Kirima sponsors. Primary education is theoretically free in Uganda but, in practice, many children do not attend school because, in reality, it is expensive for them and the quality is poor. Our schools provide the children with an enormously better start in life. 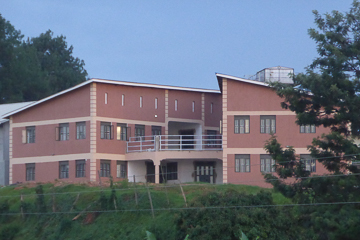 Great Lakes High School was built in 2012 to meet the needs of more able children graduating from local primary schools. It was started from scratch on an empty field and is now a thriving school teaching 400 children to “O” and “A” level. It maintains close social and educational links to the schools in the UK who support it, with regular visits from Highgate and Hull pupils. Creating the Great Lakes Regional University is our most ambitious project to date. It provides students who have good High School results the opportunity to study agri-business, entrepreneurship, business administration or to qualify as science teachers - this both gives themselves career opportunities and contributes to their community. If you are reading this, you may already be making an active contribution. On behalf of the people in Kanungu, thank you! Nearly 1,000 people in the UK sponsor a child at one of the primary or secondary schools. But 80% of the children at Nyakabungo Primary are still without a sponsor. We will send you regular newsletters and, once a year, a letter from your sponsored child with their photo … so you can see what a difference you are making. 100% of your sponsorship goes to the schools, it is not spent on UK admin or marketing. 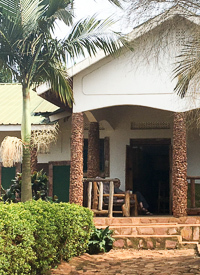 Volunteer Uganda operates 6 and 12 week volunteer teaching programmes based from in its dedicated (and fantastic) lodge which has already hosted over 1,000 young volunteers. LRTT hosts qualified teachers in its fellowship programme which focuses on improving teacher quality by running teacher training programmes in limited resource contexts. Our success relies on links with organisations in the UK and around the world who support our work. Individuals with time and/or money!